Kiss My Ivory, under jockey Adrian Ramos, breaks his maiden in the Saturday's Grade 1 Ruidoso QH Futurity trials at Ruidoso Downs. RUIDOSO DOWNS, NM�MAY 27, 2017�Making just hia second career start, Kiss My Ivory just missed making the $1 million Ruidoso QH Futurity during Saturday's final day of qualifying races at Ruidoso Downs. Kiss My Ivory posted the 6th fastest qualifying time of :17.981 seconds following an impressive 2� length win in the 10th of 13 trial races today. The futurity cutoff was :17.978 and the bay gelding was bumped by the fastest qualifier Eagle Jazz's victory in the closing trial. The son of multiple stakes sire IVORY JAMES races for owners John Lee and Kathy Lee and is trained by Wesley Giles. 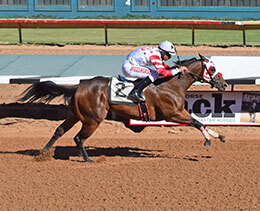 An Arizona homebred by Lee and Sherwood Racing LLC, Kiss My Ivory is out of Tres Veses by Tres Seis. The second five fastest qualifiers from more than 120 starters each day are preferred invites for the $100,000 Ruidoso QH Juvenile Invitational that will also be contested on June 11th.